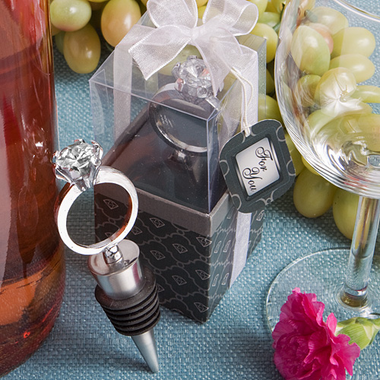 Bring on the bling with these wedding ring favors. Both functional and decorative our wedding bottle stoppers are true show stoppers. Measuring 4 ?? x 1 ? ?, each has a multi-carat diamond-like rhinestone ring charm with a classic silver metal solitaire setting. A sturdy silver metal conical base is wrapped with a black rubber gasket for a tight seal. The clear box highlights the ring with is displayed upright. The bottom of the box is an elaborate black jewelry-box-like base with a silver diamond design, tied with a white organza ribbon and an attached matching design ?For You? tag.